Former General Philip Gargantos Armstrong is is the current head of the illustrious Armstrong family, father to Major Alex Louis Armstrong, Major General Olivier Mira Armstrong, and their younger sisters Amue, Strongine, and Kathleen Elle. His wife's name is not known. A bit of a windbag, Philip enjoys relating stories of his family's grandeur and his own eventful military career to anyone unfortunate enough to become his captive audience, and seems to have passed on this family pride to Alex. 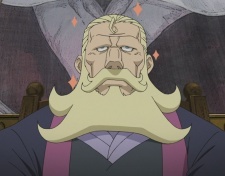 Being a former General, it would seem that Philip is a rather insightful man, quickly understanding from Oliver's demands for the Armstrong estate that Amestris was no longer safe, and taking his wife and daughter Kathleen off to Xing on an "extended vacation".